Hello, lovelies! Our traditional way of celebrating Christmas is to go out of town somewhere cold right after the Christmas Eve. Yes, we are going to Baguio City with my family on Christmas Day. This time, we are many because are four members of the family to join this time. As saying goes, "the more, the merrier". I am excited as well as the others because this time we are going to Baguio City with the newest member of the family, our fur baby, Miko. Now, before everybody gets busy for the Christmas, let me allow you to greet a Merry, Merry Christmas and a Prosperous New Year! 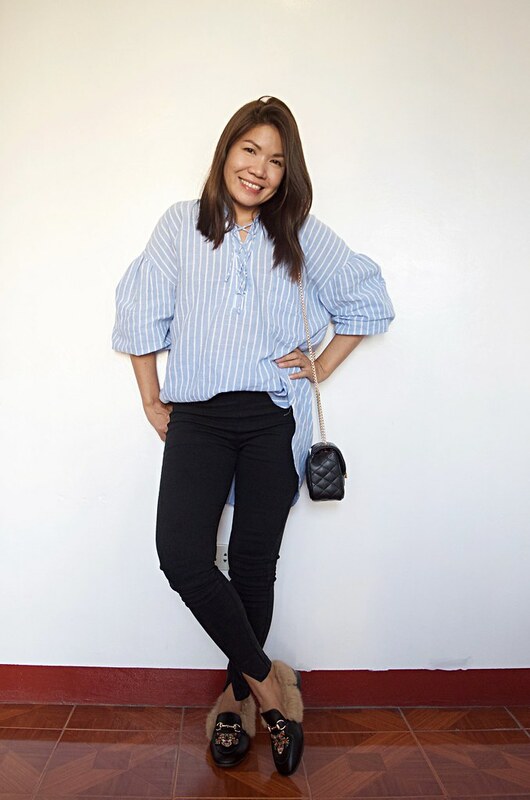 By the way, here's a style post featuring DRESSLILY. I know there will be festive food on the dinner table on the Christmas Eve, here's a perfect top and bottom for you to hide that bulging belly from all the food you'll be eating. Just click the photo or link below to see more photos. 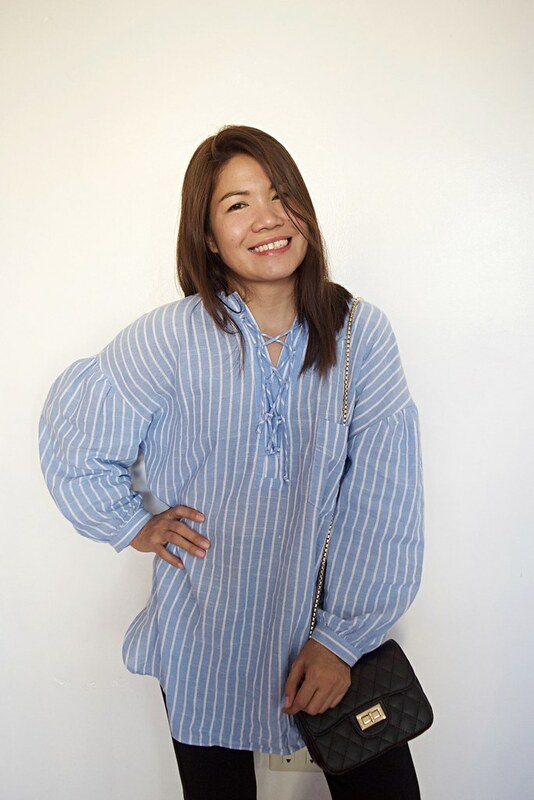 I get attracted to this puff sleeve lace up striped tunic blouse because of its loose style and color. It promised comfort and I didn't regret ordering it because I got the exact product as shown on their product page as always. I have worn this top with denim shorts and I love the look of casual chic. The cotton material weighs nothing; so soft to touch. I highly recommend this product. I have ordered many pants via online shopping and honestly, I had hits and misses. This skinny high waisted pants is a hit though. Actually, this is the only bottom that really hit the features that I want in pants. This skinny pants fit perfect on me. I will order one or two if they have available in another color like blue or white. The material is so spandex and it is really good! It has two back pockets but sadly there are no front pockets but it isn't really a big deal. I love the slit design on the front hem. I find the slit unique and that added beauty to the design. This product is worth buying and I recommend it. Looking super chic love the shoes !